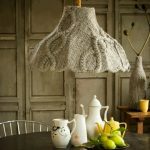 And even if you don’t go and see any scary shark movie, these craft projects are nonetheless great summer fun things to do and make. Chocolate and vanilla cakes with vanilla Italian Meringue Buttercream. 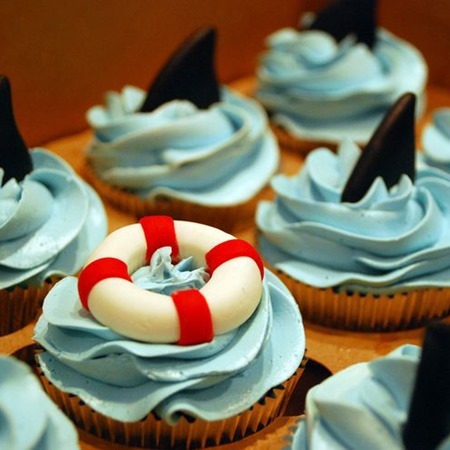 Fondant shark fin and life saver. Amazing photo by Amanda Robinson (previously at flickriver.com/photos/cakeobsessed/5381924208/). 3. 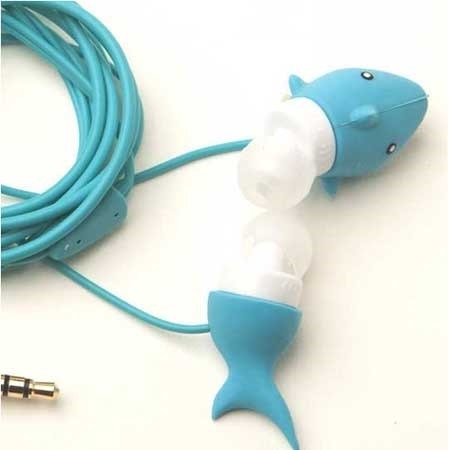 Must-haves for Shark Lovers: Shark Earplugs! Go figure! Fab Party Gift. Yes, please. For good form I should mention that the top critter clips is of Ojo the Orca and the bottom of Sid the Shark. 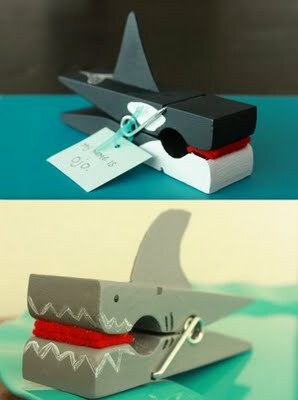 Have fun making these by gluing on cardboard fins, painting them in the appropriate colors. Add black details with a Sharpie. Much easier than painting. And glue on a bit of felt on the inside of the clamp to protect your note cards, greeting cards, recipes, coupons, etc. These were a charity prize given away by Karen of Likes of London (http://www.etsy.com/shop/likesoflondon; shop closed for business during summer). Is this adorable or is this adorable? I love this little girl in Rubie’s Costume. 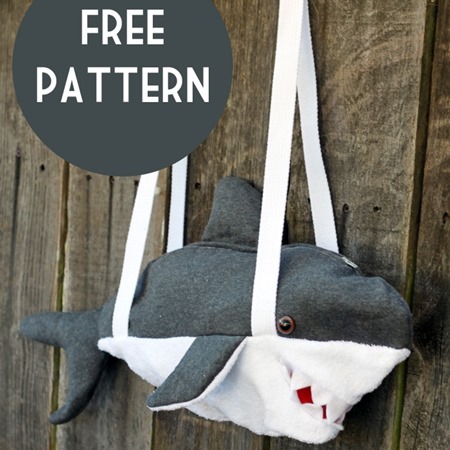 It’s a Deluxe Shark Romper Costume that kids will love to wear when it is colder outside (i.e. at Halloween) or at a party where there’s air conditioning/where it’s cool at party time. Great dress-up outfit. This shark costume comes in toddler-size too. Perhaps a more grown-uppie way to dress up for the shark party is to wear some awesome shark nail art. 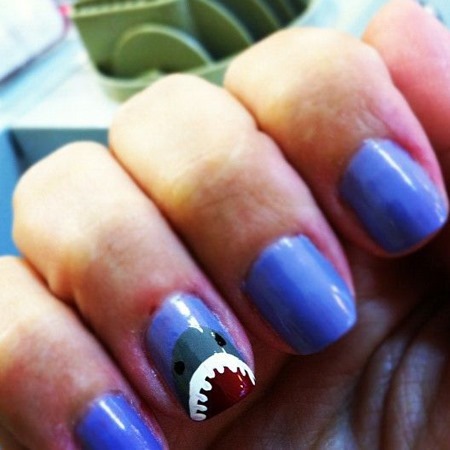 I reviewed many of them and this is one of the best shark nail art designs, I think. 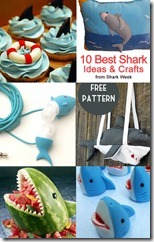 This is a free knitting pattern for a shark iPhone cozy. Don’t you just love it!? 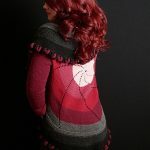 By House of Humble (site no longer online, but hsttps://www.facebook.com/houseofhumble/ is still viewable). 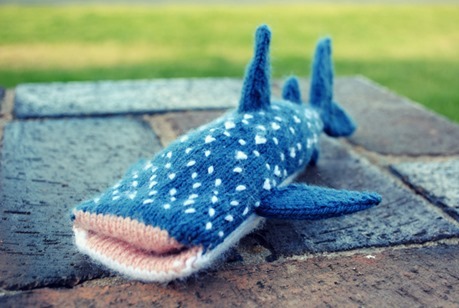 If you click the link you get rewarded with an excellent whale shark iPhone cozy free knitting pattern. 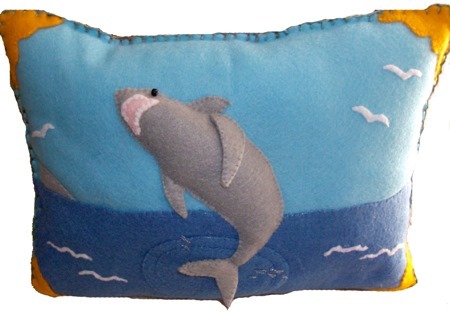 This gal made this felt pillow by just looking a shark kids coloring page. She used layers of felt to make this shark picture. Well, if she can, you can. Came out fabulously. I love the yellow for contrast. 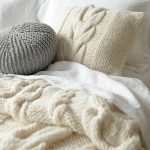 Note also the blanket stitches to make this a completely handmade shark project. 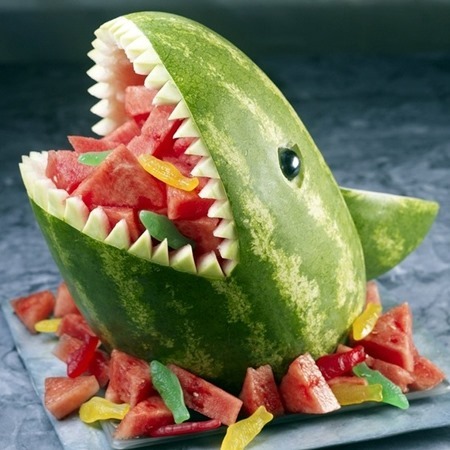 Amazing shark watermelon party table display. The shark gummies add some color too. Made with icing and water… and a ton of time, these got to be the most adorable cupcake toppers around. $37 for a dozen. Not cheap, but I give this Etsy crafter loads of credit for her original cupcake topper design! 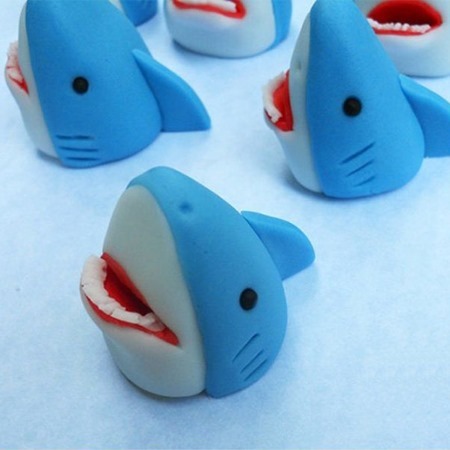 was listed as etsy.com/listing/111346425/3d-sharks-edible-cupcake-toppers.